The end of the academic year is bittersweet. We say goodbye to our graduating students that just two years ago were simply names on applications but now are like family that have blossomed at Fuqua and are heading off to accomplish great things. It is also a time when the pace slows and we can reflect on all that we have accomplished. The drumbeat of the year is driven by our student programs which engage students from across sectors, interest areas and career goals. We kicked off the year with more than 10% of the first-year class participating in a new program called the Social Impact Starting Line, a boot camp to think about their passions and skills and map their Fuqua social impact journey. Throughout the year, nearly 200 students participated in CASE courses to learn about impact investing, social entrepreneurship and work with clients around the world. Our Pop-Up workshops covered trending topics including design thinking, storytelling and launching a social venture. Our financial aid programs supported 3 new CASE Scholars (read about Nikki, Chris, and Hilary); awarded more than $70,000 to students interning with organizations such as Aspire Public Schools, LifeNet International, USAID, and more; provided loan assistance to alumni working in non-profit and government careers (over $1.8m awarded to date); and helped launch a new student social venture. That student, Anne Steptoe, began with a seed of an idea to match pre-medical students with primary care physicians in underserved communities for a 2-year fellowship program and since winning the CASE Launch Pad, has built a team, partners, funding and is planning to launch MedServe this summer! Through our events and programs, we engaged hundreds of students. 230+ first year students participated in our 12th annual Day in Durham. 56 students are serving on the boards of 23 local nonprofits through Fuqua on Board. 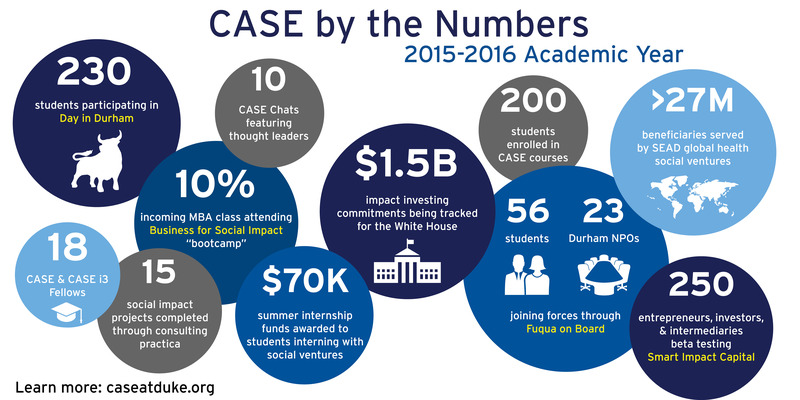 18 second-year students are working closely with us through the CASE and CASE i3 Fellowship programs. And hundreds more attended our speaker events throughout the year including the Sustainable Business and Social Impact (SBSI) conference keynotes: Rose Marcario, CEO of Patagonia, and Barbara P. Bush, CEO of Global Health Corps; as well as Nick O’Donohoe, Big Society Capital and the Gates Foundation; Sasha Dichter, Acumen Fund; Darren Walker, Ford Foundation, and many more. At CASE we translate theory into practice, helping practitioners more effectively create and scale impact. In that vein, a major effort this year has been the development of CASE’s new online learning series, beginning with the 9-module Smart Impact Capital to address common pitfalls of impact entrepreneurs seeking investment capital. These action-oriented, rigorous, online tools were beta tested by 250+ entrepreneurs, investors, advisors, and intermediaries from over 10 countries. The results were fantastic, including such feedback as: “Better tools to upgrade our language and approach, strategy, and communication to investors. Revolutionary!” We’re excited to continue this work in the year to come. Our Social Entrepreneurship Accelerator at Duke (SEAD) team has done incredible work this year – they selected our 3rd cohort of social entrepreneurs to bring the total to 25 organizations working in healthcare delivery, financing, workforce training, and product/technology innovation. 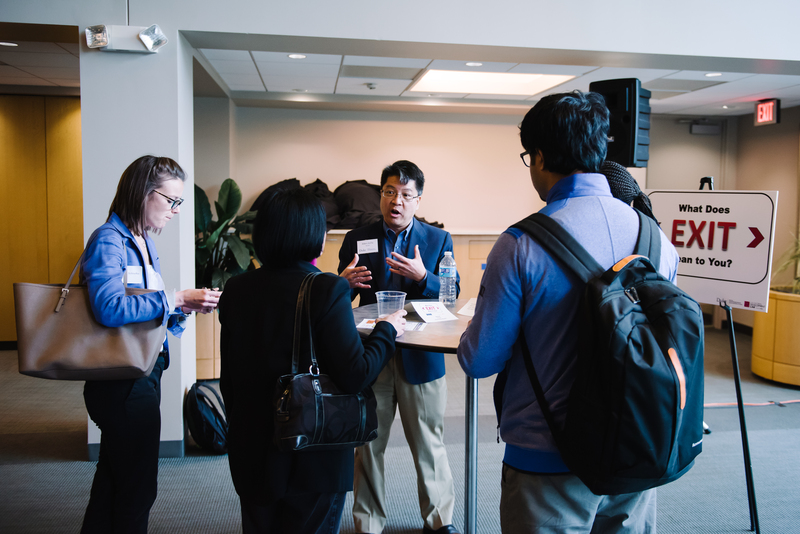 The team ran the 4th annual SEAD Summit and Symposium, the Zika Innovation Challenge, and launched programming in East Africa including site visits with SEAD innovators, impact investor workshops, a policy roundtable, a Health Hackathon, and much more. Nearly 100% of the SEAD innovators report being satisfied or very satisfied with our program and all are thrilled with the peer network that SEAD has provided to support their work. In addition to the millions of beneficiaries that they have been able to serve, our innovators reported raising over $29 million in 2013 and 2014 while in our program (we are currently collecting the 2015 data). The CASE Initiative on Impact Investing (CASE i3) continues to lead the field of impact investing. In addition to the work on the Smart Impact Capital online modules, the CASE i3 team continues to work with the White House to track $1.5B in impact investing commitments and partnered with Pacific Community Ventures on researching the Annie E. Casey Foundation’s social investment program. 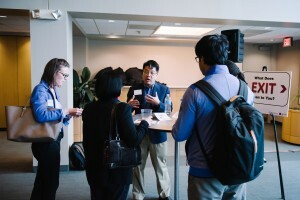 And, building on our research partnership with B Lab, CASE i3 has now launched a new LinkedIn group for academics/researchers to facilitate high quality research, data and connections related to impact investing. We continued to grow our popular CASE Chat video series with insights from John Goldstein (Imprint Capital Advisors), Mike MacHarg (MercyCorps and Simpa Networks), Maya Chorengel (Elevar Equity), Melissa Bradley (New Capitalist), Alden Zecha (Sproxil), David Ferguson (USAID), Nick O’Donohoe (Big Society Capital), and Sasha Dichter (Acumen Fund). Watch them all here! Of course, none of this is possible without an amazing team and partners. This year, we continued to build our internal team – welcoming Robyn Fehrman as our new Director of Programs and Alden Zecha as our first CASE Executive in Residence. We also announced the re-launch of our CASE Advisory Council and new members for our CASE i3 Advisory Council. 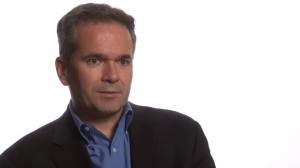 These leaders include senior executives from the Acumen Fund, Ashoka, B Lab, the Bill and Melinda Gates Foundation, Calvert Foundation, GuideStar, Habitat for Humanity International, Morgan Stanley, Virgin Unite, and more. We’re grateful to have such outstanding leaders helping us shape the path for CASE as we continue to strive for audacious goals – preparing leaders and organizations to change the world.